Need more information about booking Home 7261406 ? The “Confiance” is an operational sailingbarge originally built in the early 1900’s. During the winter of 2013 she was skillfully refitted in order to fit the high standard for accommodating guests. 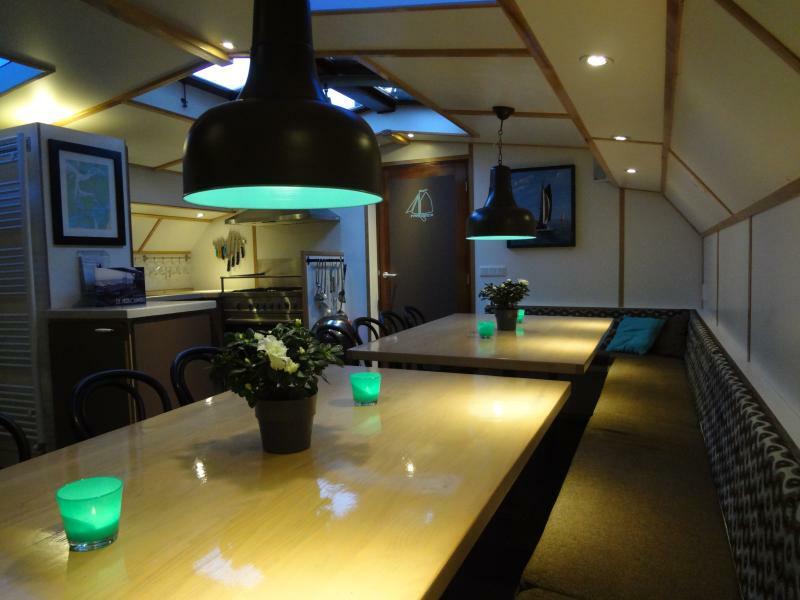 During the winter-season the “Confiance” will be moored in IJburg to serve as a picturesque Bed& Breakfast/ group accommodation. Situated on the southern shores of what used to be called the Dutch Southern sea, IJburg combines it’s many Urban qualities with a unique location and a breathtaking view. The “Confiance” can facilitate 22 guests divided over; 7 cabins for 2 persons and 2 cabins for 4 persons. The ship has 2 toilets along with 2 showers and a spacious and comfortable day area, furnished with tables and a big squishy lounge sofa. The fully equipped galley has plenty of room and should be able to satisfy all your culinary needs. Trams and Busses go back and forth between IJburg and the center of Amsterdam on a regular basis and travelling should take you no longer than 20 minutes. You can get in touch with JanWillem (the owner) through the contact form on this page. Send JanWillem (the owner) an email through the contact form on this page. Alternatively, if there’s a phone number on this page, you can call them. How do I contact JanWillem (the owner)? If you’ve already booked, go to Manage your holiday booking to view JanWillem the owner's contact details or send them a message. Or send JanWillem (the owner) an enquiry through the Contact the owner/manager form if you’d like a quote or more info first. When you pay online through the Book your stay form, a booking request is sent to JanWillem (the owner). You’ll find out within 24 hours whether they’ve accepted - no money will leave your account before then. You can also request a quote from JanWillem (the owner) through the contact form. The owner will email you the total cost for your dates and a link to book and pay online. Use the Book your stay form to pay provisionally online. You can pay by credit/debit card or PayPal. JanWillem (the owner) will have 24 hours to accept the booking and no money will leave your account before then. Why can't I call JanWillem (the owner) before booking? You’ll need to contact JanWillem (the owner) to do this. Send them a message in Manage your holiday booking or through the contact form on this page. You can request to change the dates or number of people on your booking via the Manage your holiday booking page. To change your holiday dates use the Edit booking button. If you need to change the number of guests staying then send JanWillem (the owner) a message. If JanWillem (the owner) agrees, they’ll send you a revised quote outlining the changes. You can review and accept/decline this from the Manage your holiday booking page. You’ll have 48 hours to take action before the revised quote expires.